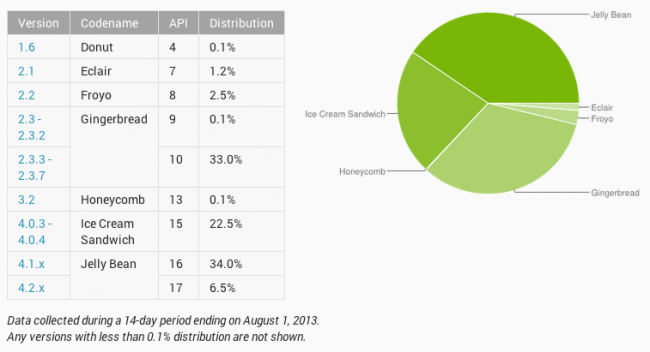 The Android distribution numbers were updated for August last night, showing that Jelly Bean’s foothold in the Android pie continues to grow at a steady pace. Now at 40%, up from last month’s 38%, it now has a very nice lead over Gingerbread, which still has a large chunk at 33%. As for the rest – Ice Cream Sandwich 22.5% (was 23.3%), Honeycomb and Donut remain at 0.1% (was 0.1%), Gingerbread 33% (was 34.1%), Eclair 1.2% (was 1.4%), and Froyo 2.5% (was 3.1%).